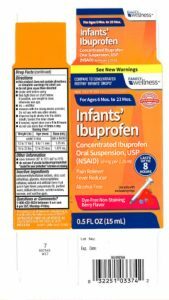 Tris Pharmaceutical company has issued a recall on generic children’s ibuprofen due to higher concentrations of the drug found in some of the products. According to the FDA, the recall covers Equate: Infants’ Ibuprofen sold in Walmart, CVS Health: Infants’ Ibuprofen sold in CVS, and Family Wellness: Infants’ Ibuprofen sold at Family Dollar Services, Inc.
For more information you can see the official FDA site. Consumers with questions regarding this recall can contact Tris Pharma’s Customer Service at 732-940-0358.